Paisley Burns Club was founded on January 29, 1805, and claims to be the oldest formally constituted Burns Club in the world. Formed by a group of enthusiastic Paisley men, mainly weavers and including Robert Tannahill, the Paisley poet, its primary purpose was to celebrate the birthday of Robert Burns and cherish his memory in other ways. The club’s membership, traditionally all male, following Burns’ Bachelor Club format, has included many influential and notable local men as members and honorary members. Over the years many local businessmen, doctors, politicians and writers have been involved with the club. The club’s 1st secretary was Paisley born Robert Tannahill, a weaver, songwriter and poet himself. Tannahill was a prolific writer, writing many poems and songs during his life, including ‘The Braes o’ Balquhither’ and ‘Thou Bonnie Wood o’ Craigielea’. Burns had links with Paisley during his life, paying a visit to Paisley on a couple of occasions. On one occasion, in his letter to Agnes McLehose, dated 22 February 1788, and writing under the name of Sylvander, he recounted his meeting in Paisley with his “worthy wise, friend, Mr Pattison. Paisley also featured as the place where Jean Armour, Burns’ lover, spent her confinement when she was pregnant with his child. Jean was sent by her disapproving parents to stay with her uncle, Andrew Purdie, who lived in Paisley. Jean, who became Burns’ wife, had 9 children with him during their life together. 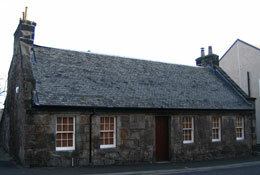 The club regularly meets in Tannahill’s Cottage, in Paisley. The cottage, once owned by poet Robert Tannahill, was donated to the club in 1933. Tannahill’s father, James Tannahill, built the cottage in 1775 as a dwelling house and loom shop for the family’s weaving business. It was the house that Tannahill was raised in and remained his home throughout his life. The club is still active and its members still continue to uphold and celebrate the memory or Robert Burns.